Click on the pictures at right to read the childhood stories. Enjoy them yourself, then ask students to read them. They can read them online or easily print them out. • Bill Withers wrote about “Grandma’s Hands.” Hazel Dickens wrote about “Mama’s Hand.” Look at the lyrics of both songs. What do the hands do in each song? Ask students to think about the hands of somebody they know. What do those hands do? Make a list of six or more things. Write one page about the person, concentrating on the things those hands do. If needed, ease students into this assignment by using yourself (or somebody famous) as an example. List three things on the board you do with your hands. Start each paragraph with the subject: “My teacher’s hands,” then add a verb and go from there. • What obstacles did these three West Virginian artists overcome to get to the place where they are today? Make a list for each artist as a group, then ask students to choose one to write about. Start with the person’s name: “Hazel Dickens,” for instance. Choose a verb and go from there. • Using quotes: Ask students to list or underline things each artist said that they like. Pick two or three quotes that mean most to you. Why? As a group, write a few paragraphs about one artist, weaving quotes from the artist with facts about their childhood. In a final paragraph, tell why you liked what they said. • Bill, Hazel and Billy Edd entertained themselves as children without spending much money. Ask students to write about the things each artist did to have fun that didn’t involve toys bought in a store or spending much money. What do you do for fun? What other things might you do? Discuss this as a group in advance. Why was it important for those three to entertain themselves in ways that don’t cost money? How is it different today? • All three artists were helped by people who changed their lives. Their stories give us an opening for essays or discussion about people who help us and the importance of taking those opportunities or looking for such opportunities. 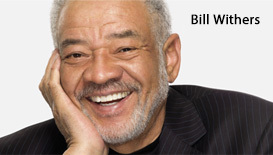 “The most important people are people you see every day.” - Bill Withers. He thinks people are wrong to pay more attention to entertainers than to ordinary people. What do you think? “I didn’t know I could till I tried.” - Hazel Dickens. What was Hazel talking about? Can you think of a time when you might have said that? All three artists say they never imagined they’d be so successful. Think about yourself 20 years from now. What are your dreams? • Choose one childhood story. What questions do you think the interviewer had to ask that artist, to get that information? Be a guinea pig. Let your students interview about your childhood. • Pick one of the three artists. Read the lyrics to each of their songs. Do the lyrics of that person’s songs come from their life? How? It’s easy to see in Hazel Dickens’s “Mama’s Hand” or Billy Edd Wheeler’s “Ain’t Going Home Soon,” but maybe less obvious in “Coward of the County” or “Lean on Me.” Discuss this as a group. • Sometimes songwriters put bad grammar in song lyrics on purpose. When is this okay in a song? What are the purposes of a song that might make it okay? • Each suggestion under “Writing assignments” can also be a whole class discussion. • Find more material online about one of the artists, after he or she grew up. Write 2 pages about his or her life. Cite the websites you used in your paper. • Hazel Dickens’s song, “West Virginia, My Home,” is a love song for West Virginia. In his “Appalachian Lifestyles“ blog entry, blogger Mathew Burns illustrated that song with photos. Depending on their skill level, students could try something similar or could illustrate the song with drawings and pictures. They might even create an online display. This could also be done offline as an on-paper assignment. • In his childhood story, Billy Edd Wheeler gives us a child’s-eye view in a coal camp. Use his story and pictures in West Virginia history studies. If you click on his photo to the right, you will find a list of suggestions to help you do this. • Add Hazel Dickens’s “Black Lung” and “Clay County Miner” to the study of coal camps and family life in West Virginia. • Bill Withers’s childhood story can add a personal touch to your social studies study of segregation. What was going on in West Virginia as a whole while he grew up? The kids in his neighborhood played together, but he still had to go to the back door of the drug store if he wanted a soda. 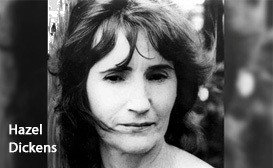 • In her song, “West Virginia, My Home,” Hazel Dickens sings of people longing for West Virginia after they leave. The state song, “West Virginia Hills“ is about people leaving. What are some of the reasons people leave West Virginia, even when they don’t want to leave? How might we change that? 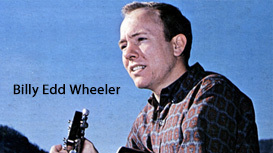 Billy Edd Wheeler’s humorous song, “Ode to the Little Brown Shack Out Back” was his first big national hit. It actually tells a lot about changing lifestyles in West Virginia. Ponder how you might use this song to add a very personal touch to those studies. • Most songs have a “hook,” a phrase that repeats and often is the title of the song. What did any of these artists say that would make a good hook? Write some lines that might go into that song. Now try to make up a tune. • Think of things people you know often say, things like “I declare” or “For the life of me,” that would make a good song title? What expressions do people you know often use? Try to write that song. • Any of the writing assignments above can generate material for a song. If you have feedback or ideas to add to this list, please send them to katelong@wvmusichalloffame.com. We’d love to hear from you. We’d also love to read anything your students write. Send it to us, with permission to post it.